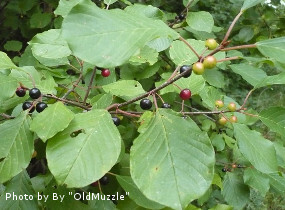 BUCKTHORN, ALDER (Rhamnus alnus) (Rhamnus frangula). Hedging Plants, Trees, Shrubs and Conifers. Warning: Some parts of this plant may cause a skin irritation and are poisonous.